Why African countries banning imports of fruit and veg is a blunt tool - SABC News - Breaking news, special reports, world, business, sport coverage of all South African current events. Africa's news leader. Zambia’s government has just banned the imports of some farm produce as a way of promoting the growth of the agriculture sector. The Conversation Africa’s Samantha Spooner asked Calestous Juma about the impact this will have on African countries and their agricultural sectors. Which African countries are the biggest importers of fruit and vegetables and how much do they rely on to meet local demand? 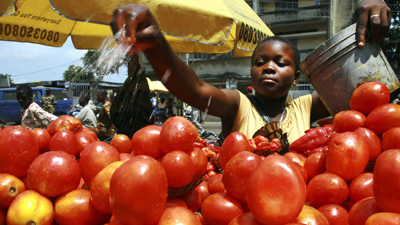 In 2013, the import value of all fruit and vegetable categories for the African region was about $1.2bn. However, the trade tends to be localised in countries that have poor infrastructure. They have short shelf lives so it’s important to get them to the market quickly. Consumers are also discerning and avoid buying produce on the edge of being spoiled. Many of them may not have refrigeration at home so are selective in what they buy. Poor infrastructure means that countries such as Nigeria end up being major tomato importers because they can’t keep up with the demand. Over the last 12 months Nigeria imported 189.5 tons of tomato paste. This is despite the fact that they have states with ample land for growing tomatoes close to major urban centres such as Lagos. The importance of investing in infrastructure, as I argue in The New Harvest, has significant implications for food production, storage and distribution. But poor infrastructure isn’t the only driver of imports, especially of fruit. Other factors such as taste, widely available variations among nations – like India – in fruit production, and seasonal availability are important forces behind the globalisation of the fruit trade. Advances in freight technology and expansion of shipping have also made it possible for exporters to achieve economies of scale that out compete local producers. China, for example, is emerging as a major fruit exporter partly because of its world class capacity in shipping and logistics. Is banning imports a good way to boost the local agricultural sector? Has it worked elsewhere? Banning imports is a blunt tool for stimulating local production. It often triggers unnecessary trade reprisals unless there’s evidence of health concerns. And they’re a poor substitute for measures such as investments in local infrastructure that would enable local producers to compete favourably. But it’s also important to take into account the political context that leads to bans. Countries like Zambia, for example, don’t have a long agricultural tradition and are under pressure to protect the emerging sector. Zambia historically specialised in mineral exports and relied on food imports from neighbouring countries and international markets. It sought to diversify it’s economy when global copper markets tanked late last century and the economy collapsed. As a recent entrant into the green vegetable export market, Zambia has previously faced phytosanitary barriers to its exports. Given the circumstances it’s clear why the government would want to protect local producers. But the ban is unlikely to result in the desired outcomes except to provide relief for existing producers. Bans are usually not permanent and so do serve as incentives to encourage new investment that may take a long time to show results. Are international trading rules inclusive enough to accommodate a country’s different needs and pressures? While I think bans don’t work in many cases, international trade rules cannot operate well without any consideration for their implications on ordinary people. International trade can be designed as a positive-sum game. And it should be. But it will continue to be challenged when it carries the seeds of irreparable loss of livelihoods. Of course we need international trade, but it needs to be guided by different ethical stands such equity so countries are not pushed into continuous conflict because of the fear of being excluded from the global market. 4. What impact does importing agricultural produce have on local agricultural sectors? Imports are not necessarily bad in themselves. They are part of a global system that’s theoretically built on the principle of reciprocity. This includes the expectation of reasonable balance of trade between the partners. Quite often bans are motivated by imbalances in trade relations. Banning imports simply because one is seeking to protect local agriculture – and without just cause – is generally a poor approach to achieving food security. In many cases, imbalances in agricultural trade exist because African countries haven’t made the necessary investments – such as storage facilities and capacity building in international trade practices – that allow them to become important players in the global economy. Therefore, imports and suppressed local production tend to reinforce each other. Even when countries increase production they still have to contend with the challenges of breaking long-term import contracts or violating international trading rules. 5. Have other African countries introduced similar bans? Many countries tend to introduce bans to reduce the amount of foreign exchange used for imports, not necessarily to stimulate local production. When foreign exchange earnings improve they tend to reverse the bans. This often affects those local businesses that may have thought the bans would benefit them. It’s therefore important to first put in place policies and incentives that promote local production. Their effective implementation often makes the need to introduce bans unnecessary. Nigeria has previously imposed bans on imports. One example was barley. This helped to stimulate the use of sorghum to produce beer. But the motivation was foreign exchange management, not necessarily to promoting innovation in brewing. In another Nigerian case, foreign exporters of wheat stifled efforts to introduce bread that was made with 40% cassava. The government didn’t ban wheat imports but a bill put to the legislature to require the blend was starved of support and defeated. Such is the power of food import lobbies. In this case the initiative would’ve stood a better chance of success if it had found a way to extend benefits to those who were likely to lose from reduced wheat imports. It’s such losers who become the sources of resistance to new ideas, as I argue in Innovation and Its Enemies. 6. Apart from banning imports, what should African countries be doing to grow their agricultural sectors? Banning imports may protect a few existing producers but in the long run it should not be considered as a tool to grow the agricultural sector. The focus should be on laying foundations for agricultural productivity, starting with infrastructure and working up the value chain to developing agro-industries. Without reliable roads, power supply and irrigation there is little chance that Africa will radically transform its agriculture. Much effort is going into scientific research, which is commendable. But the gains from productivity will have little impact if produce can’t reach the market because of poor infrastructure and a lack of competence in logistics. And more than anything else Africa needs agricultural engineering. Today Africa exports less food than Thailand. The immediate goal should be to learn how Thailand became an agricultural force and apply the lessons to regional trade. Africa will become a more serious international player when it can trade effectively with itself. It’s like the world of football. Those countries that don’t have strong regional leagues tend to shine in the first rounds of the World Cup tournament then they flounder. This entry was posted on 20 Mar 2017,08:09AM at 8:09 AM and is filed under Opinion. You can follow any responses to this entry through the RSS 2.0 feed. You can leave a response, or trackback from your own site.